How can it be so quick and efficient to build a Quad-Lock Pool? Initially the Quad-lock modular panels are dry-stacked (without mortar) and interlocked forming an inner and outer layer- creating shuttering for the pool walls. 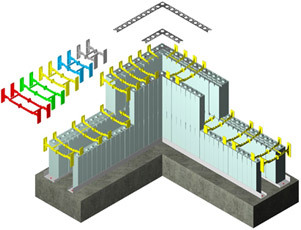 Reinforced steel can be installed before or during the assembly of the panels. Concrete is then pumped into the cavity to form the structural element of the walls and floor. After the concrete has cured, the panels are left in place permanently providing internal and external insulation. If the pool is to be sited in a new building, it is quite possible to have the complete buiding shell constructed with Quad-Lock panels for additional insulation and energy saving. 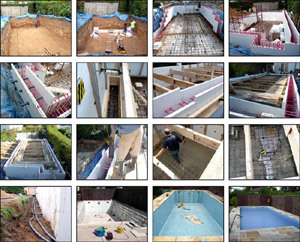 This building technology has been used successfully for many years in building energy efficient homes but is now revolutionising the UK swimming pool build industry.